If you’ve shopped at a grocery store in Iowa recently, don’t opt for scrambled eggs for breakfast — or any meal. An Iowa egg producer has issued a recall for 228 million eggs after a suspected link to an outbreak of salmonella poisoning. The potentially life-threatening condition is more common than you may realize, making it even more important to know how to recognize the signs of salmonella. Tainted eggs have sickened several hundred Californians and some people in Minnesota, health officials recently reported, and the Food and Drug Administration is investigating. No one should take any chances because salmonella can be life-threatening, especially to people with weakened immune systems. Here are some important facts to know about salmonella. Who is at highest risk for salmonella poisoning? People with impaired immune systems should be more careful, as should the elderly and infants. People in these groups are less able to fight off the infection, so it can spread from the intestines to the bloodstream, and then to other body sites. Salmonella poisoning is serious and can be fatal unless the person is treated promptly with antibiotics. While you shouldn’t stop eating out at restaurants or enjoying Eggs Benedict at home, it’s crucial to know the symptoms of salmonella and take precautions. These symptoms start 12 to 72 hours after consuming a contaminated food or beverage, according to the Centers for Disease Control and Prevention. How long will salmonella poisoning last? The illness usually lasts four to seven days. Most people recover without antibiotic treatment. When the diarrhea is severe, however, you can get dehydrated and become ill enough to require hospitalization. Don’t swear off eggs, an economical source of nutrition and great for a fast meal fix. But there are precautions you should take to stay safe from salmonella poisoning. Keep eggs refrigerated at at all times. Eggs should be cooked until both the white and the yolk are firm, then eaten promptly after cooking. Promptly refrigerate unused or leftover egg-containing foods. 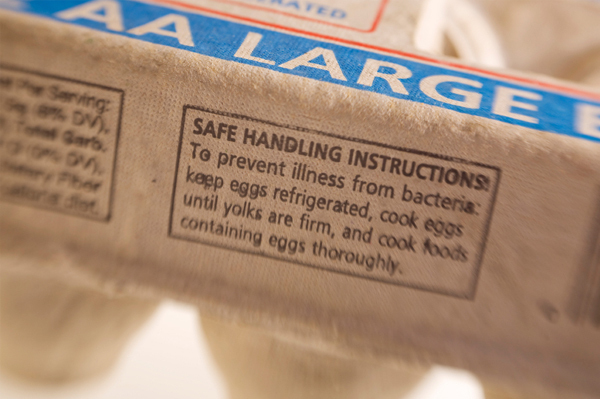 Do your eggs have salmonella? The eggs which may be infected with salmonella are produced by Wright County Egg and sold in retail stores under a variety of brand names. Eggs are packed in 6-egg, dozen egg, and 18-egg cartons with Julian dates ranging from 136 to 225 and plant numbers 1026, 1413 and 1946. Dates and codes can be found stamped on the end of the egg carton. The plant number begins with the letter P and then the number. The Julian date follows the plant number, for example: P-1946 223. If you have potentially contaminated eggs, do not eat them. Take the eggs back to the store from which you bought them and ask for a full refund. Consumption of raw or undercooked eggs should be avoided, especially by young children, elderly persons and persons with weakened immune systems or debilitating illness. If you experience any signs of salmonella poisoning, see a medical professional immediately. Do your tomatoes have salmonella?